Most people only drink sparkling white wine around Valentine’s Day or New Year’s Eve, but sparkling white wine pairs well with many foods, and can turn any moment into a special occasion. Here are the things you should know. Different regions have their own name for the type of sparkling white wine they produce. Sparkling wine produced in the champagne region of France is called Champagne. Sparkling wine produced in the other areas of France is called Crémant. Prosecco is from Veneto, Italy. Asti and Moscato d’Asti are from Piedmont, Italy. Cava is from Spain, and Sekt is from Germany and Austria. All of these wines are known for having different flavors, and the best way to see what you like is to taste them! 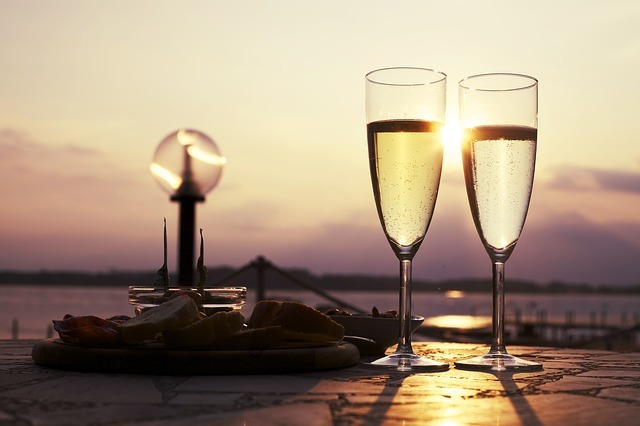 All sparkling wines have different sweetness levels. Depending on whether you will be pairing the sparkling white wine with an appetizer or dessert, these levels are important to know about. The wines are usually classified as extra brut, brut, extra-dry extra dry, sec, demi-sec, and doux with extra brut being the driest and doux being the sweetest. When you open your bottle of sparkling wine, don’t let the cork shoot across the room. Ease the cork out gently, so that you keep the bubbles in it. If you drape a towel over the cork while opening the bottle, you will have more control and an easier time opening the bottle properly. To truly experience the best flavors of the sparkling wine, make sure you serve it at the right temperature. Chilling it properly will also make sure you don’t have frothy bubbles. 40° to 50° F is the temperature sparkling wine should be served at, and you can do this by placing it for two hours in the refrigerator or twenty minutes in an ice bucket before serving. I find it rare that I don’t finish a bottle of sparkling wine, but if you do have a bottle that goes flat, you can revive the bubbles by dropping a raisin in a bottle and waiting two minutes. Because the bubbles are caused by carbon dioxide, the carbon dioxide that is left will stick to the raisin, and then release itself back into the sparkling wine as bubbles. Try it, it works! Sparkling white wine is excellent with the same foods that white wine is good with, and especially pairs well with cheese. It’s great with both sweet and savory foods, and, of course, is also excellent when drunk alone. It’s adaptability is a great reason to always keep a few bottles on hand. 6 Responses to "Everything You Need To Know About Sparkling White Wine"
Very good post. Most people usually call all sparkling vines Champagne. Great tips for opening the bottle safely and reviving the bubbles with raisins. Thanks! Yes, it’s amazing how the raisin works! Revive flat sparkling wine with a raisin is a cool trick 🙂 This I need to try on my next bottle. Thanks! Using a raisin to bring back bubbles to a flat bottle? Very interesting little trick there. I’ll have to try it out.